Explore the use of animal fats as an oil feedstock in the production of biodiesel. This article covers the advantages and challenges of using oil from animal fat in biodiesel fuel. Beef tallow. Photo: FotoosvanRobin; Wikimedia Commons. About one-third of the fats and oils produced in the United States are animal fats. This includes beef tallow, pork lard, and chicken fat. Animal fats are attractive feedstocks for biodiesel because their cost is substantially lower than the cost of vegetable oil. This is partly because the market for animal fat is much more limited than the market for vegetable oil, since much of the animal fat produced in the U.S. is not considered edible by humans. Animal fat is currently added to pet food and animal feed, and used for industrial purposes such as soap making. Much of the domestic animal fat supply is exported. Animal fat feedstocks can be made into high-quality biodiesel that meets the ASTM specifications for biodiesel. However, there are some drawbacks and challenges to using animal fat feedstocks. Animal fats are highly saturated, which means that the fat solidifies at a relatively high temperature. Therefore, biodiesel made from animal fat has a high cloud point. For example, biodiesel made from beef tallow and pork lard has a cloud point in the range of 55°F to 60°F. B100 (pure biodiesel) made from animal fat should only be used in a very warm climate. However, animal fat biodiesel can be blended with petro-diesel. At lower blends such as B5 (a blend of 5% biodiesel with 95% petro-diesel), the high cloud point of the animal fat biodiesel does not have much effect on the cloud point of the blend. The composition, or fatty acid profile, of various animal fats is shown in Table 1. These data show how saturated the fat will be, which in turn determines how readily it will solidify as the temperature decreases. 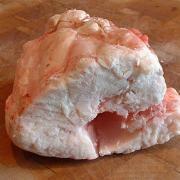 Beef tallow and pork lard are typically about 40% saturated (sum of myristic, palmitic and stearic acids). Chicken fat is lower at about 30-33%. For comparison, soybean oil is about 14% saturated and canola oil is only 6%. Thus, tallow and lard are usually solid at room temperature and chicken fat, while usually still liquid, is very viscous and nearly solid. When the animal fat is made into biodiesel, the concern about solidification at lower temperatures continues. The methyl esters from the saturated fatty acids, mainly methyl stearate and methyl palmitate, have high melting points. In theory, the saturated fatty acids in animal fats should contribute to better oxidative stability for biodiesel. Animal fats contain very little of the polyunsaturated fatty acids, such as linoleic acid and linolenic acid, that make vegetable oils such as soybean oil and linseed oil so prone to rancidity. However, in practice animal fat is not always more stable than vegetable oil, because vegetable oils often contain natural anti-oxidants. For example, a test of the peroxide content of lard and vegetable oil showed that the lard experienced oxidation faster than the vegetable oil (Stuckey, 1972). Animal fats contain very little of the natural anti-oxidants such as vitamin E that protect vegetable oils. In some cases, used cooking oils may also contain artificial antioxidants that are added to oil to extend their life, and these artificial anti-oxidants can in turn extend the life of biodiesel made from used cooking oil. Animal fat feedstocks result in biodiesel with a high cetane number, which is an important quality parameter for diesel fuels. The saturated fatty acids are the source of this high cetane number and values over 60 are common. Soybean oil based biodiesel usually has a cetane number of about 48-52 and petroleum-based diesel fuel is usually between 40 and 44. When animal fat biodiesel is blended with petro-diesel, this high cetane number can help the engine start more quickly and run more quietly. One of the important attributes of biodiesel is that it lowers the levels of harmful pollutants in the exhaust of diesel engines. One exception to this is oxides of nitrogen (NOx), which are implicated in ozone and smog formation. Biodiesel tends to emit slightly more nitrous oxides than petro-diesel. Many reasons have been cited for this increase in NOx (Tat et al., 2007) and there is still considerable debate. However, it has been shown that biodiesel from animal fats tends to produce a smaller increase in NOx and in some cases no increase (McCormick et al., 2001). The primary reason for this is probably that animal fat biodiesel has a high cetane number (>60) compared with vegetable oil biodiesel (48 to 55). Higher cetane number is known to lower NOx by lowering temperatures during the critical early part of the combustion process. Animal fats can be challenging feedstocks for biodiesel because they frequently contain contaminants that should be removed before the fuel is used in an engine. Phospholipids, or gums, will cause insoluble precipitates when they come into contact with water. Since these precipitates will plug fuel filters, they must be removed from the fuel. Most of this material will separate with the glycerin during processing, or be removed during the purification step (water washing or ion exchange), so it is rare for these compounds to be found in the fuel. In fact, since phospholipids can de-activate exhaust aftertreatment devices on diesel vehicles, they are usually removed from the feedstock before it is converted to fuel. Most commonly, the gums are removed by adding water and citric or phosphoric acid to the feedstock and then separating the precipitates with a centrifuge. Polymers that are formed naturally at the high temperatures of the rendering process can contribute to a higher viscosity in biodiesel made from animal fat. This higher viscosity can sometimes prevent animal fat biodiesel from passing the viscosity ASTM specification. If this is the case, the animal fat biodiesel can be blended with a lower-viscosity biodiesel. An occasional problem with rendered fats is polyethylene in the fat which originates from plastic bags, ear tags, or other plastic that is mixed with the animal byproducts. Finely divided polyethylene has been found to cause cloudiness in the fuel and could plug the fuel filter. Producers who are used to working with vegetable oil may be confused by this, since with vegetable oil biodiesel, cloudiness is caused mainly by water in the fuel. If animal fat biodiesel shows cloudiness even after water is removed, this may be caused by stray polyethylene, which can be removed by passing the biodiesel through a fine filter. Sulfur can sometimes be a problem for animal fat-based biodiesel. Biodiesel sold for on-highway use is only allowed to contain up to 15 ppm of sulfur. Some samples of beef tallow have been found to contain over 100 ppm of sulfur and chicken fat frequently contains a similar amount. The sulfur apparently originates from sulfur-containing amino acids associated with proteins that carry over from the rendering process. Measurements of the sulfur levels in biodiesel produced from animal fats have shown that the sulfur level usually decreases by about half when the conversion takes place. However, the remaining sulfur can be difficult to remove. Vacuum distillation is about the only reliable technique for removing this sulfur. Alternatively, biodiesel high in sulfur can be sold for non-highway use, such as fuel for a boiler or heater. McCormick, R.L., M.S. Graboski, T.L. Alleman, A.M. Herring, and K.S. Tyson, “Impact of Biodiesel Source Material and Chemical Structure on Emissions of Criteria Pollutants from a Heavy-Duty Engine,” Environ. Sci. Technol. V. 35, No. 9, pp. 1742-1747, 2001. Stuckey, Ben N. (1972) “Antioxidants as Food Stabilizers,” in Handbook of Food Additives 2nd edition, ed. Thomas Furia. Cleveland, OH: CRC Press. Tat, M. E., J. Van Gerpen, and P.S. Wang, “Fuel Property Effects on Injection Timing, Ignition Timing, and Oxides of Nitrogen Emissions for Biodiesel-fueled Engines”, ASABE Transactions, V. 50, No. 4, pp. 1123-1128, 2007. NOx Emissions and Biodiesel — this two-page “Tech Note” gives an overview of the source of nitrous oxide emissions from biodiesel.